Originally, Scott’s Addition was part of the Mayo family Plantation. 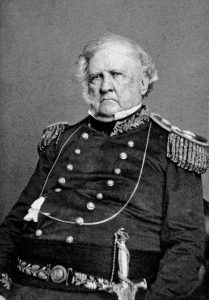 Major General Winfield Scott, a hero of the War of 1812 and the Mexican War received the property as a dowry when he married Elizabeth Mayo. Throughout the 19th Century, Broad Street was Richmond’s primary turnpike and the railroad was a significant part of the area. At the turn of the 20th Century, businesses anxiously moved from downtown to Scott’s Addition because of the centrally located transportation center served by streetcars, the railroad, and the highways. Binswanger Glass and Curles Neck Dairy (and the associated Dairy Bar) were two of the early businesses in the area. “Addition” is a word that was used to describe an addition to the city grid. In the early 20th Century the area was annexed to the City of Richmond. The boundaries of Scott’s Addition remain unchanged from its early history. The neighborhood is bounded on the south by Broad Street, on the east by The Boulevard, on the north by the railroad tracks and on the west by I-195. Scott’s Addition Historic District is one of the larger industrial and commercial districts in Richmond. The district contains brick and frame buildings in a variety of architectural styles, including Colonial Revival, Classical Revival, Mission, International Style, and Art Deco. Several skillfully crafted Moderne buildings are reflections of a style rarely seen in Richmond. The area remained largely undeveloped until the early 1900s when it saw the construction of modest dwellings and businesses. The second wave of development occurred between the 1930s and 1950s with the building of large industrial plants, commercial buildings, and warehouses amongst the existing dwellings. The second phase of development largely defines the types of buildings located at present in the district. Named for General Winfield Scott, Scott’s Addition was a part of the vast, 600-acre Hermitage estate that Scott inherited in 1818 from his father-in-law, Colonel John Mayo. The portion of land known as Scott’s Addition remained in the family until the late 19th century. The earliest subdivision plan dating from November 1890 called for residential development of the area. Subsequent plans followed this trend until the railroad emerged as a driving force in the growth of the locality. 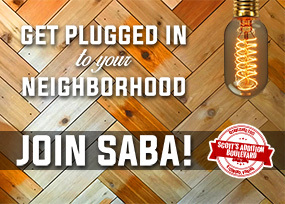 Today, Scott’s Addition is home to a diverse mix of businesses, including film studios, graphics, and marketing companies, advertising groups, and architectural firms. Adaptive reuse and other preservation efforts have made this neighborhood attractive to not only businesses, but to residents as well, and the area has received renewed attention in recent years. The district encompasses 284 contributing buildings, 2 contributing structure, and 2 contributing objects in a largely commercial and industrial section of Richmond. It was largely developed after 1900 and includes representative examples of the Colonial Revival, Classical Revival, and Art Deco styles. Notable buildings include the Jones Motor Car Company (1926), the former Cadillac and LaSalle dealership (1928), Radio WMBG Broadcasting Station (1938), Boulevard Baptist Church (c. 1916), China-American Tobacco & Trading Company Warehouse (1920), National Biscuit Factory (Nabisco) (1923), Hofheimer Building (1928) G. F. O’Connell House (1920), State Planters Bank & Trust Company (1948), Chevrolet Parts Depot (General Motors Corporation) warehouse and training center (1929), Cavalier Arena Skating Rink (1940), the Binswanger Glass Factory (1946), Mid-Atlantic Coca-Cola Bottling Company Inc. (1953), and the Seaboard Building (1956). The neighborhood was added to the National Register of Historic Places in 2005.